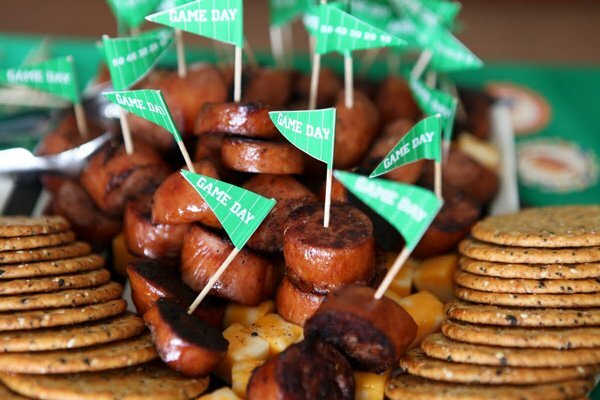 If you’re a football fan (or maybe planning to host a Super Bowl party next weekend! 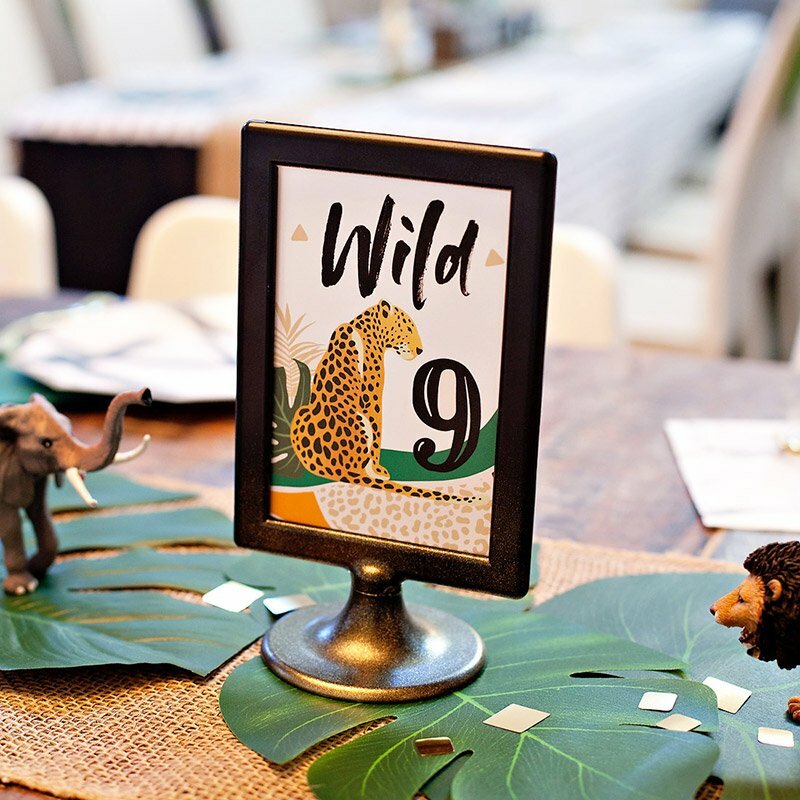 ), then get ready to feast your eyes on this incredible party… Brittany of GreyGrey Designs appropriately titled it “Tate’s Tailg8 Party,” since the birthday boy was turning eight. How clever is that? 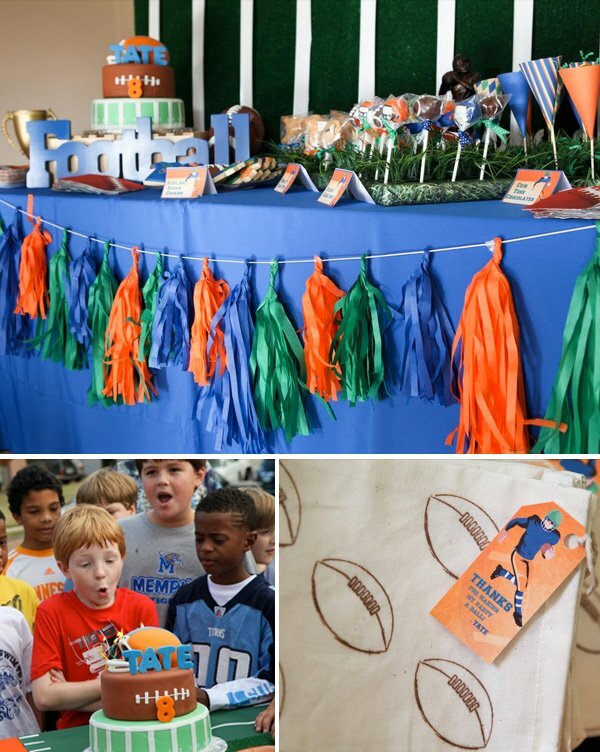 As a Mom of three little boys myself (Jessica Wilcox, Modern Moments Designs), I can totally appreciate a well styled boys birthday party! 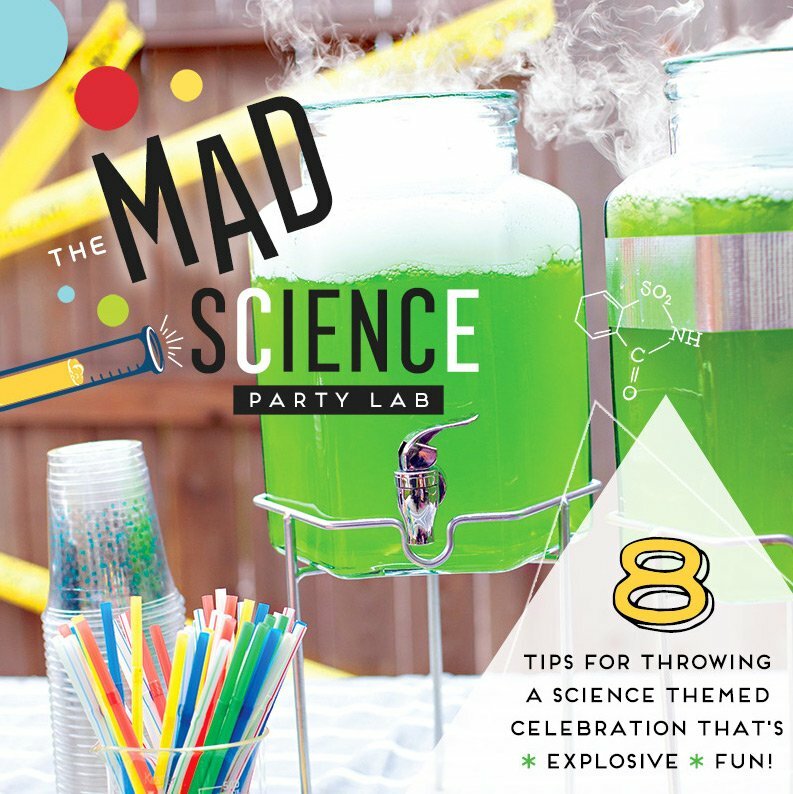 “Last month, my one of my favorite clients threw her son an 8th birthday party. 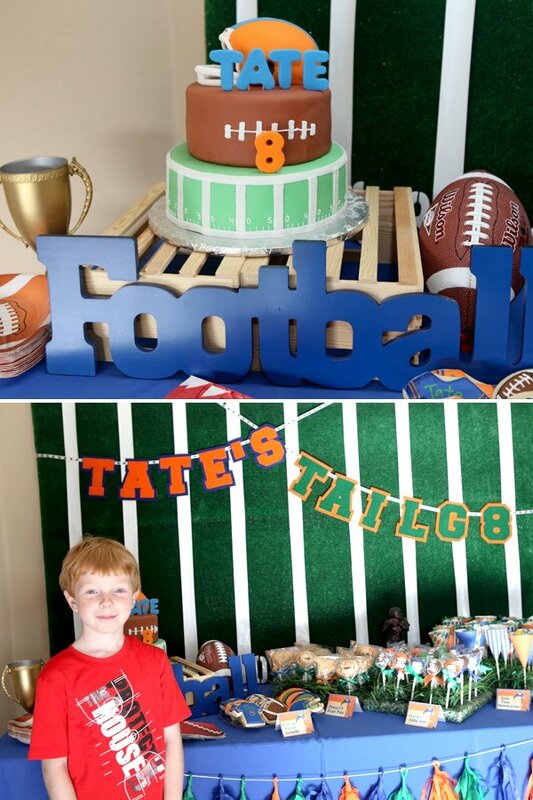 This year she decided on a football theme because Tate loves football. 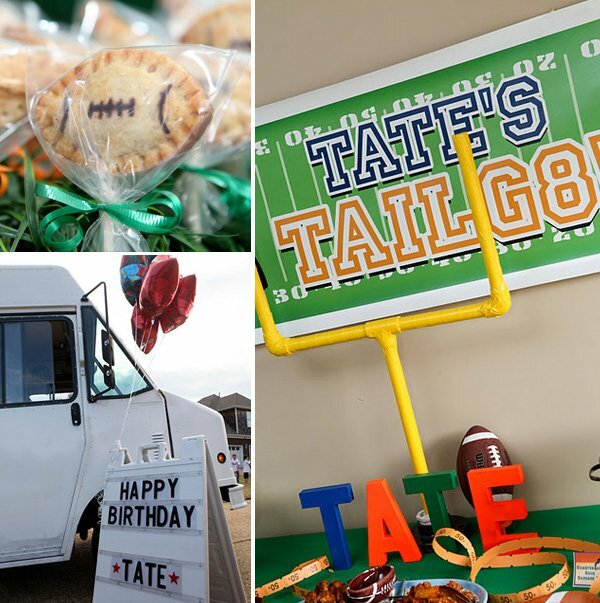 When I realized that he was turning 8 this year, I thought a “Tailg8” party was the PERFECT THEME! 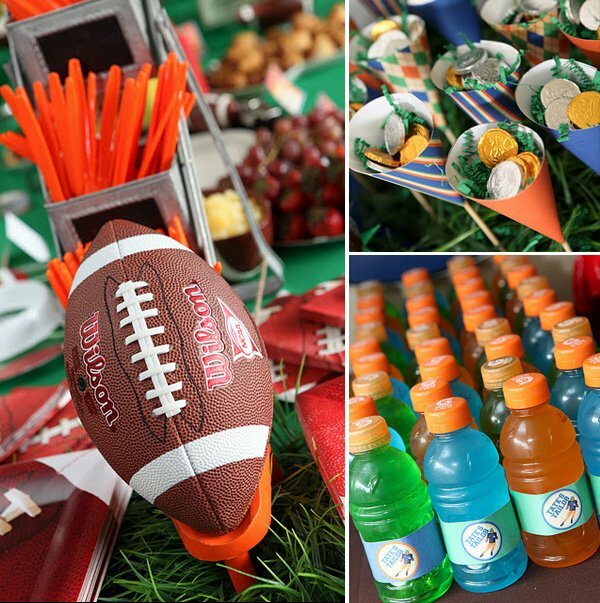 My inspiration for the party was classic, vintage football, with a varsity feel. I didn’t want to focus on a particular team or league. I thought it was way more kid-friendly to go retro and classic. We started off with the invitations. Doodlez Designs on Etsy customized these lanyard invitations for us. What a cute, fun detail to send kids a lanyard to wear, so that they feel like they are getting invited to something really special! The dessert table was inspired by chenille letter jacket letters. I was obsessed with spelling out his name in chenille letters. Who didn’t love their letter jacket? Confession: (I wanted one of the fancy script names to go on mine.) I found a fabulous vendor who custom made them for me! These are also something he can keep forever in his room. Wendy always uses her pristine garage for Tate’s parties. So, we made several stations. One for dessert, one for favors, one for food, and one for beverages. 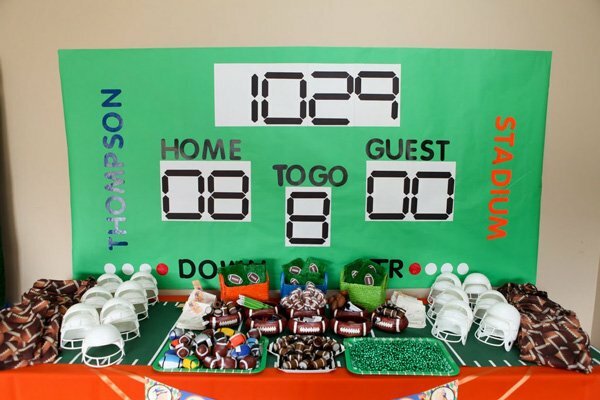 The backdrop for the dessert table was simply a large piece of astroturf taped onto some foamboard. Of course everyone has seen this look on the actual table, but I wanted to take it up to the backdrop. The fun chenille letters are definitely the focal point. My friend Melissa cut out the numbers for me on her Cricut. The adorable cake was made by Mad Lily Cakery, who is a new vendor for me. It turned out absolutely precious and was just perfect! So, if you are local in Memphis, check her out! I got that “football” sign at Hobby Lobby. It was black, but that was nothing a little spray paint can’t fix. I liked the idea of using those crates for a cake stand because they reminded me of old school bleachers. The vintage trophy cup is from an antique mall. 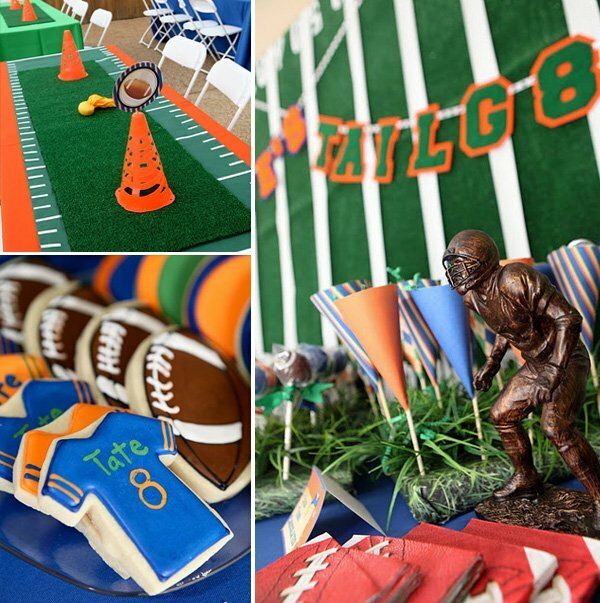 The dessert station included the cake, Penalty Flag Pie Pops, Coin Toss Chocolates, Coach’s Cake Pops, and Sideline Sugar Cookies. We also used one of my favorite vendors, Mom’s Killer Cakes. 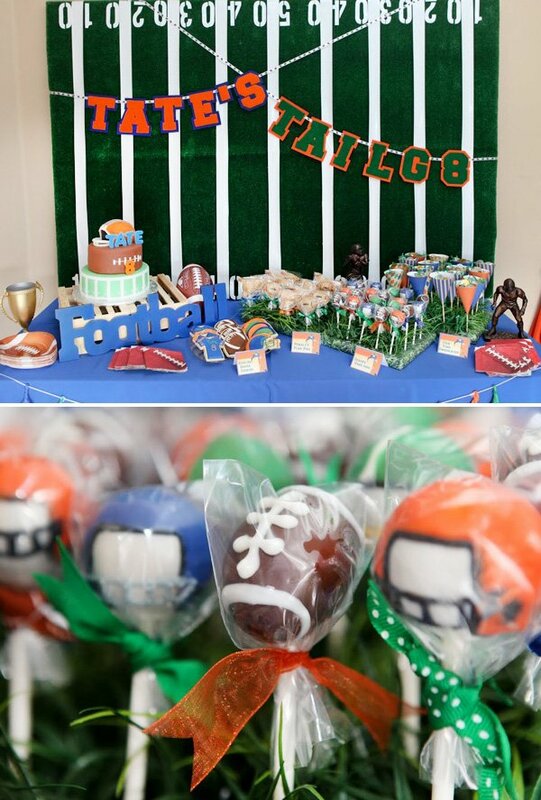 Sarah knocked it out of the park (or scored a touchdown, I should say) with these helmet and football cake pops. They were absolutely perfect! Everything was displayed on the cake table in grass mats. I covered styrofoam in grass printed scrapbook paper and then used my grass mats from Easter to provide some texture on top. 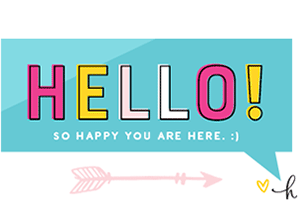 The papers for these cones and the printables are from the wonderful Gwynn Wasson Designs , who did all the fabulous printables for me! Gywnn is a DREAM to work with and she bent over backwards to make my vision of a vintage tailgate party come true. The pom pom garland is from PomFlair. I actually WON this as a prize on a Children’s Party Network chat! So, ladies, next time we have a chat, you might get some good prizes! Carmen, I love this garland, it was the perfect addition! For the savory food, I once again had help from the wonderful Karen at Simple Done Catering and Cupcakes . 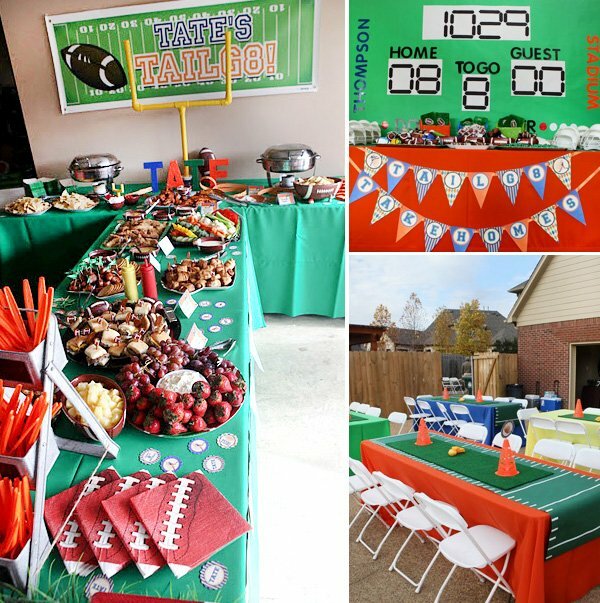 We focused on “football” food with a build-your-own Noseguard Nacho Bar, “Pigskins”-in-blanket, “Tate-r” Chips, Timeout Twice Baked Potatoes, Wide Receiver Wings, Shotgun Sausage and Cheese, Off Sides Sliders, Hail Mary Hot Bacon Dip, Quarterback Sack Sausage Dip, Chicken Con-Tenders, and a Field Goal Fruit Tray. The adorable goal post was made by the The Hip Hostess , my Memphis girls! I wrapped it with yellow duct tape to complete the look. That banner is from Shindigz. I reused the same letters from Tate’s Mario party last year and painted them the colors to match this scheme. For the favors, I wanted to do a “favor bar.” I have seen this done at several parties and I think that is perfect for this theme. The kids could take home their own mix of football themed goodies like koozies, football Mardi Gras beads, pencils, suckers, hacky sacks, and noisemakers. I totally dig this party. Beautiful + butch at the same time. I adore the turf usage. The little helmets are the cutest. Ever. 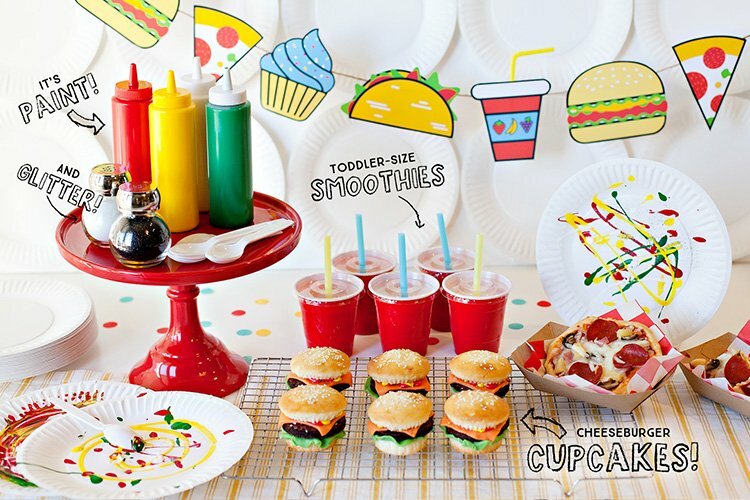 LoVe every yard of this party by GreyGrey Designs! Brittany can quarterback my team anytime! Again i love the theme… the photos are wonderful! Love the details.. where did you get the astroturf? I’m having a hard time finding it. Thanks! HOW DID YOU DO THE RUNNERS ON THE TABLES? 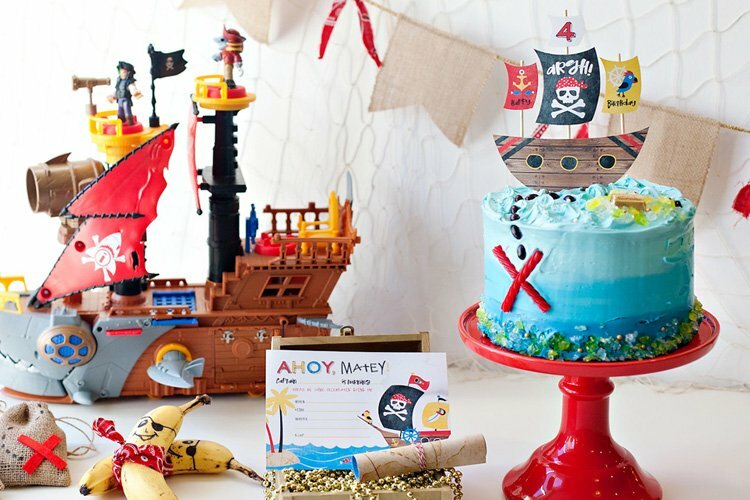 Looking to replicate some of these ideas for my son’s party! Where did you get the field paper used on the tables? the one under the turf. I cant find helmets like these! I need some blue (preferably) or grey (if not blue) like the white ones you have on display for a football themed gender revel can you tell me where you found them?? Love the party! it looks beautiful!